The rich heritage of Udaipur has resulted in a unique culture, customs and traditions. Know more about culture of Udaipur, Rajasthan. Udaipur is a romantic land that had been favorite place of the Rajputs. This beautiful city has received a rich cultural heritage from the bygone age. If you are planning to tour Udaipur, it is quite necessary to know about the culture, customs and traditions that the city follows. In the present times, Udaipur has adopted the life style of big cities; still there are some customs & traditions in the city that would be new for you. Udaipur receives ample number of tourists from all over the world every year. The city is still inhabited by people of Bhil tribe, so you could see people dressed in typical Rajsthani dress with loads of silver jewelry during your trip. Colorful festivals and fairs depict the cultural prosperity of Udaipur. The lakes, temples, huge forts and palaces boast about the rich legacy of this city. In this article, we have covered the subjects of people, cuisine, language, religion, folk dance and music of Udaipur. Udaipur cuisine comprises vegetarian dishes as the place is highly dominated by Jainism and Vaishnavism. Food is usually made from lots of vegetables and lentils. It is seasoned with a great variety of spices that are unique to the lands of Rajasthan. You can find type of curries ranging from Lentil to yoghurt. Dried mango by the name of 'Ocra' and beans of 'sangri' is accompanied by many meals. Deep-fried breads and extensive use of chili makes the cuisine of Udaipur, a delicious one. Udaipur dwellers are really friendly and good to be with. On your first look, you will find them rugged, but these people are really good at heart. Untouched by the pace of modern times, these desert people are well-built, simple and cheerful. Here, people usually prefer wearing bright colored clothes. The traditional attire of women is 'Ghaghra choli' (Skirt & blouse) and for men, angrakha (Kurta) and dhoti would do. In the modern times, people prefer wearing casual dress to match the contemporary fashion. To communicate, language is really important. Mewari is the primary language of Udaipur, yet Rajasthani, Hindi and English are also common in the city. Jainism is the main religion which is observed in Udaipur. Other religions include Hinduism, Islam, Sikhism and Christianity in the decreasing order. The dynamic and vibrant dance adds sparkle to this romantic city of Udaipur. Udaipur doesn't have its own dance that is especially linked with it. 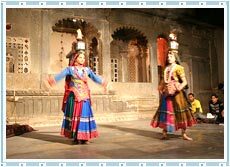 However, the dances that are famous all over Rajasthan make the dance of Udaipur too. Bhavai, Ghoomar, Kachhi Ghodi, Kalbeliya and Terahtaali are the unusual dances of Rajasthan. Still, dance of Dandi Gair is associated with Marwar and hence with Udaipur. Talking about music, the dwellers of Udaipur find solace in the melodious music of Morchang, Naad, Tanpura, Sarangi and many other instruments that used to echo the courts of Mewar rulers.